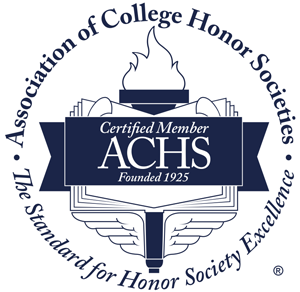 Association with the only honor society devoted exclusively to students of Spanish in four-year colleges and universities, the largest foreign-language honor society in existence (over 180,000 members) and one of the elite as attested by its membership in the Association of College Honor Societies, the nation’s only certifying agency for college and university honor societies. Exclusive access to Sigma Delta Pi’s undergraduate study abroad awards for study in Spanish-speaking countries. Graduate students may apply for research grants. Active and ambitious student members may apply as a chapter for Chapter Project Grants to help finance their group’s activities that complement the mission of Sigma Delta Pi. Distinctive student honors such as the Gabriela Mistral Award, available to one outstanding member per chapter annually; the Mario Vargas Llosa Award, a joint Sigma Delta Pi-AATSP recognition granted yearly to one outstanding, undergraduate student major or minor of Spanish; and the Ana María Matute Award, a joint Sigma Delta Pi-Asociación Internacional de Hispanistas recognition that may be granted each triennium to one exceptional graduate student of Spanish/Hispanic Studies. National and local leadership opportunities through appointment to the national Board of Student Advisers, election to chapter offices, and the direction of chapter projects (see Chapter Handbook for ideas); the latter may result in such national distinctions as the Honor Chapter award, the Premio Ignacio y Sophie Galbis , the Premio Fénix, and the Premio Frida Kahlo. Special rates on insurance through Geico. Exclusive member discounts on select hotels and auto rentals. An enhanced résumé afforded by serving as an active chapter officer: organizational leadership and initiative are attractive qualities to prospective employers. Supportive network of regional and national officers to provide guidance for chapter activities and Society-related issues. Available awards for outstanding faculty of Hispanic Studies or members of one’s local community who have made exceptional efforts in furthering Sigma Delta Pi’s mission. Closer association with students of similar interests and out-of-class interaction with members of faculty. Opportunities to participate and/or present in Sigma Delta Pi’s annual sessions, held in conjunction with the AATSP and the Kentucky Foreign Language Conference, and the triennial convention, held during the meeting of the AATSP.